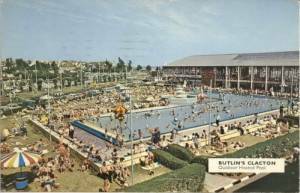 The second Butlin's camp to be built, Billy Butlin bought the West Clacton Estate in 1936. The area already contained miniature golf courses and a boating lake with Billy Butlin adding an amusement park and opening it in 1937. He then went on to build the new holiday camp on another part of the land, opening the doors to campers on 11th June 1938. The camp originally catered for 1,000 campers and this was increased to 1,500 for the following year. The camp closed on the outbreak of war in 1939 and was immediately taken over by the Army. It was intended to use the site for housing prisoners of war and the camp was soon surrounded by barbed wire and floodlights, much to the anger of local residents who feared the lights would attract the enemy. The POW plan never came to fruition so the site instead became home to survivors from Dunkirk, and later as a training centre for the Pioneer Corps. Unlike Skegness, the camp suffered badly during the war and presented a very sorry state when handed back. Repairs were immediately put into effect and the site reopened as a holiday camp in April 1946. In 1955 the camp was enlarged and took over some of the adjoining land previously occupied by the amusement park. This new area enabled a further 600 chalets to be built and the capacity was raised to 6,000. What remained of the amusement park was then incorporated into the camp itself. The original set of Gallopers, which was installed here in 1946, remained in use until the 1970s. A miniature railway was added in 1960 and ran on a route near the boating lake in the southeast corner. This railway later gained fame for appearing in the closing credits of the BBC sitcom "Hi-de-Hi". Cliff Richard made his professional debut at Clacton. His group, Cliff Richard & The Drifters, were booked for a 4-week residency in 1958. In October 1983 Butlin's made the shock announcement that both Clacton and Filey would be closed. The company said that Clacton had not made a profit for three years and did not justify the huge investment needed to bring it up to an acceptable standard. As with Filey, the news came as a hard blow to the surrounding area which relied heavily on the camp for its income. At the time Clacton employed over 900 seasonal staff with a further 67 permanent workers. It had also been paying around £216,000 a year in rates to the local council. The East Anglian Tourist Board inspected the site but said that it was in such a poor state of repair that future buyers would be put off. However a buyer was found in the form of a company called Amusement Enterprises Ltd. The site was purchased for around £2 million and ambitious plans were announced for a "Disneyland" style theme park, along with a change of name to Atlas Park. The new venture opened in May 1984 but the site was little changed from the Butlin's era. Most of the chalets remained closed but some did reopen. The new venture only lasted 4 months before the owners ran into financial difficulties and called in the receivers. Three massive auctions were held during the summer of 1985 to dispose of the camp contents and the land was again sold. By 1987 everything had been demolished and the site totally cleared. The area is now occupied entirely by a new housing development which the architects claim is "built on the positive features of the original cabins, with prefabricated timber construction, opportunities for sea views from upper floor living areas, and orientation to catch the sun and cheat the winds. The result is a relaxed, intimate, pattern of chalets and gardens which responds to the grain of the original layout". There is now nothing remaining to indicate that a mighty holiday camp once stood here for nearly 50 years. 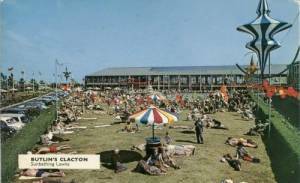 Click here for a detailed history of Clacton Camp.